Imported from the US, Ram Board™ is the ultimate hard floor protection product - a robust, heavy duty floor roll for all hard floors and surfaces, available in both home and industrial editions. We are proud to be able to offer this outstanding product for your DIY projects with FREE next day shipping. Ram Board™is also 'breathable', temporary floor protection, engineered for Contractors, designed with cost and efficiency in mind. This quality product is easy to lay out quickly and can be used again. Ram Board™ is non-staining and utilises Flex-Fiber™ technology which enables the proper curing of new floors on jobsites to be done. Its exclusive Spill Guard™ technology provides added protection against water, paint, mud and more. It is an ideal product for concrete and expensive floors, gym and sports hall flooring cover, laminate and marble floors. 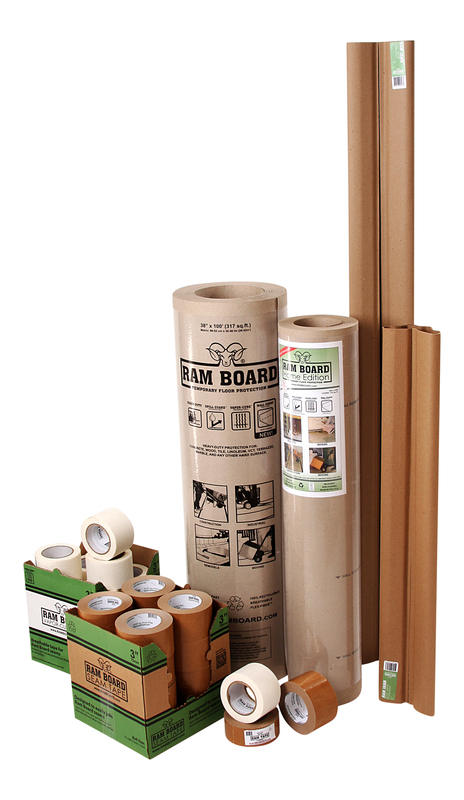 See our range of accessories to accompany our Ram Board roll range.